As part of its sustainability efforts and commitment to investment in Islay, Bruichladdich has announced plans to build at an in-house maltings by 2023 and confirmed the purchase of a farm, Shore House Croft. One of Scotland’s most innovative distilleries, Bruichladdich will build a maltings, due to be operational by 2023. Plans are subject to change and planning permission, but the proposed facility will consist of Saladin boxes rather than floor maltings. It will be used predominantly to malt small batches, including barley grown on the island, organic grain from Elgin, and bere barley from Orkney. The aim is that it will provide about 50% of the distillery’s needs, and may expand to 100% in time. Bruichladdich has been at the forefront of trialling different types of barley, as the innovative Bruichladdich Bere Barley bottling attests. To help with further experimentation, the distillery has purchased the 30 acre Shore House Croft where it can run barley trials. At the moment Bruichladdich uses 100% Scottish barley, with 42% of this grown on Islay. The new maltings will enable this barley to be processed on the island rather than being sent to Inverness, cutting down on food, or rather booze, miles. It’s all part of the distillery’s drive to be more sustainable. The team is currently looking into using renewable energy sources such as tidal power, water turbine and biomass. It already uses electric vehicles and hot waste water to run the central heating. “Running a business from an island makes us distinctly aware that our social, economic and environmental impact must be a positive one,” said CEO, Douglas Taylor. Bruichladdich dates back to 1881 but has existed in its present form since 2001 when it was revived by Mark Reynier, Simon Coughlin and Jim McEwan. It was acquired by Rémy Cointreau in 2012. The distillery produces one million litres of pure alcohol per year, which goes into a range of spirits including The Botanist gin, and the Bruichladdich, Port Charlotte and Octomore whisky brands. Expansion plans also include new warehouses. There are four in the pipeline, meaning that all its casks can continue to be matured on Islay. You might be surprised to learn that the distillery is the largest private sector employer on the island. It employs 80 people (and a further 20 on the mainland), more than Diageo, and second only to the council. Good work, team laddy! 36 New Master of Malt Single Cask Series Bottlings! 1 Comment on 36 New Master of Malt Single Cask Series Bottlings! Our Single Cask Series is bigger than ever, with a whopping 36 new whiskies for our Single Cask Series! Who wouldn’t want to savour the joy of a single cask whisky? The following editions have spent years maturing in a specific cask and now each idiosyncrasy is ready for you to interpret and enjoy. Each and every bottling here is truly unique. Once that cask is emptied, there is no more, people! Friday has arrived, meaning another edition of The Nightcap is in order, complete with all the booze news from the week that was. Surf’s up, folks. Look at a calendar…. Friday has arrived, meaning another edition of The Nightcap is in order, complete with all the booze news from the week that was. Surf’s up, folks. Look at a calendar. Whether that calendar is made of paper or pixels, it’ll tell you that today is Friday. Unless you’re reading this on a day that isn’t Friday – then the calendar will tell you that it was once Friday. That’s generally how calendars work. Sometimes they give you the definition of interesting words or a picture of a small dog hanging around in a fishing village, but mostly they exist to tell you when Friday is. It’s today. Therefore, The Nightcap is a thing. Firstly, let’s see what happened on the blog this week. Our Annie recapped the first leg of her visit to Piedmont with Cocchi, then showed us how to drink like a particularly famous British super spy. Kristy got the low-down on the final addition to Diageo’s 2018 Special Releases (they’re now available to pre-order, too!). Henry chatted to Cabby’s Rum founder Moses Odong about making rum in London and The Knowledge, then gave us a Macallan history lesson. Phew. On to the rest of this week’s booze news! Renegade Rum Distillery: the future of rum? No Comments on Renegade Rum Distillery: the future of rum? Pretty profound, huh? Alright, full disclosure. He didn’t actually say that, Batman did. But he could’ve, because in many ways Reynier is the Batman of the spirits industry. Like Batman, he excels at subverting the system. Drawing from years of experience as a vigneron, shipper, wholesaler and retailer, Reynier turns traditional practice on its head. By channelling a winemaker’s approach to distilling, he paves the way for a new normal. And (like Gotham), the booze is far better for it. No word on whether he too knows 157 different types of martial arts. To mark another superb Fèis Ìle we asked the good public (that’s you!) to share a snap of your top Islay tipple and to flaunt your #MoMFeisIle t-shirt to be in with a chance of enjoying a bottle of our very own Bruichladdich 23 Year Old 1993 – Single Cask – and we’ve got our winner! After all the spectacular sunshine, delightful drams and roaming data charges we’ve all finally recovered enough from another incredible Fèis Ìle to announce the two lucky whisky-lovers who have won our Islay moment competition! The inaugural MoM Fèis Ìle Awards are here! 2 Comments on The inaugural MoM Fèis Ìle Awards are here! There were drams, live bands galore (often the same one), much merriment and more epic dogs than you could even try to count. Yes, folks – Fèis Ìle happened. And now, partly as an excuse to relive the best bits, partly to give mega kudos to the star performers, behold: we present the entirely-not-scientific-at-all, totally-subjective-in-every-way MoM Fèis Ìle Awards 2018! Well. We’ve just about sort-of recovered. Fèis Ìle 2018 was an absolute riot of whisky geekery, drams of much deliciousness, and of course, incredible, incredible people. We had a proper blast on Islay, and we’re still wading through the reams of content, video footage, and social posts from the week at the pinnacle of the whisky calendar. And as we reminisced all the action, debating heatedly at MoM HQ as to which tip-top tour was the most tremendous and which masterclass was most masterful, it suddenly became clear: The MoM Fèis Ìle Awards should be a thing! Share your Islay moment and win a bottle of Bruichladdich 23 Year Old 1993! 5 Comments on Share your Islay moment and win a bottle of Bruichladdich 23 Year Old 1993! Fèis Ìle 2018 is well and truly under way. The sun is spectacularly shining, the drams are flowing, and we’ve got not one but two chances for you to win a full bottle of something delicious: our very own Bruichladdich 23 Year Old 1993 – Single Cask, no less! We’re back on Islay for Fèis Ìle 2018 and we’re not going to lie, we’re having a blast. Eight distilleries, eight days, much merriment and some of the finest whisky folk under the sun to share a dram with… it’s heaven. And to add to the fun and games, we have not one but TWO competitions to further spread the whisky love! My alarm rang through the MoM-slash-Whisky Lounge villa at 7am, alerting the entire house that it was time to wake up. Ordinarily, I’d have remained horizontal. But today was a little different. Today was Bruichladdich day. Showered and dressed, we whizzed us across the island with the help of Boutique-y Whisky Dave Worthington, who put the pedal to the metal in a bid to get us to Port Ellen Maltings for 9.20am. If you’ve never had the privilege of touring real life maltings in action, check our Instagram Stories. You’re in for a treat. We’re going to Fèis Ìle 2018! 1 Comment on We’re going to Fèis Ìle 2018! Drum roll please, folks… after too-long a hiatus we are packing our bags and heading to Fèis Ìle 2018! From this Saturday (26 May) to the following one (3 June) we will be busily heading to the official distillery days, plus a selection of rather marvellous additional locations to keep us on our toes. And… the freebies are back! Welcome to The Macallan Whisky Lounge: the UK’s first! No Comments on Welcome to The Macallan Whisky Lounge: the UK’s first! It’s not often a celebrated whisky distillery opens a dedicated whisky lounge, but Speyside masters The Macallan have only gone and done just that. Located within Vauxhall-based European-Japanese fusion restaurant Four Degree, this is the brand’s first UK lounge, with the other situated on the second floor of the Galaxy Hotel in Macau, China (the Vauxhall location is thankfully a far simpler commute). 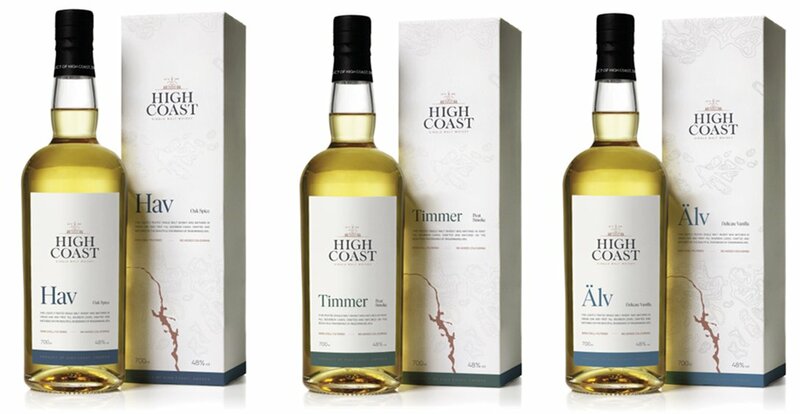 High Coast Distillery has collaborated with @berrybrosrudd to bring fantastic new Swedish whisky to the UK! Come and explore the wonderful world of botanicals through the delicious dimension of #gin!